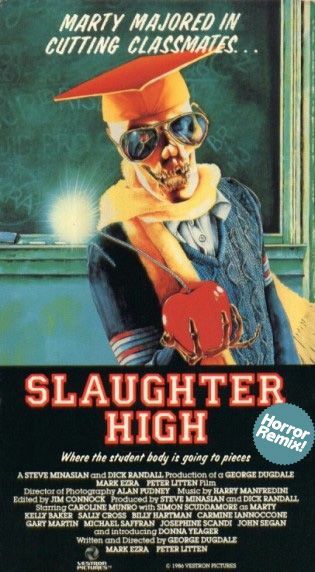 Slaughter High is about a boy named Marty. He was harassed, and picked on in high school. A group of kids played several pranks on him, and these pranks were REALLY bad. The last prank ended tragically. Fats Forward to 5 years later. The gang of kids meet up again for a reunion. One of them set it up at the old high school. The school is now abandoned, and they have to break in. For some reason, the Janitor is still there, but he tells them to go ahead and have fun because they give him a beer. They start partying ,and looking at their old lockers, and they see something of Marty’s. One girl feels sorry for Marty but another guy calms her down. Once the kills begin, it is great. Every kills is creative and gory. We see a figure in a jester mask, hunting them one by one throughout the school. It appears Marty is back to exact revenge. After the first person is killed, they find out they are locked in the school. They begin looking for a way out. Now, there are a number of illogical things in this movie. First of all, I don’t know anyone who has a 5 year reunion. Second of all, after the first kid dies, a girl gets blood all over her. They all run away in a panic, yet she runs to the bathroom, and finds a bathtub. Hrr friend has just been killed, and she decides to take a bath!? More importantly, why is there a bathtub in a school bathroom. Anyways, the bathtub doesn’t seem to really work….and she dies a horrible death this is an 80s movie. it is a horror slasher. WHO CARES if it has some illogical parts. I for one don’t. This movie has really great deaths. The ending…. there is a twist. Having recently seen Haute Tension, I can compare the two. The only way they are similar is that there is a twist, which kind of left me disappointed…..THEN right after the twist, comes a great, if not the best kill, in the movie.